Yesterday in a congressional hearing, U.S. Congressman Harold “Hal” Rogers (KY-05) pressed Secretary of Commerce, John Bryson, on maintaining and executing additional countervailing duties against China to ensure fair competition for American businesses and workers. American workers have been hampered by China’s deliberate efforts to undervalue its currency, subsidize Chinese industries, and create barriers for U.S. exports. Last year’s trade deficit with China was $272 billion, the second largest in history, and a 2011 Economic Policy Institute report indicates this explosive growth displaced 2.8 million U.S. jobs between 2001 and 2010 alone. Earlier this March, Congressman Rogers voted in favor of H.R. 4105, legislation, which would help protect U.S. businesses from the unfair international trade practices of countries like China and Vietnam. In yesterday’s hearing, Rogers stressed the responsibility of the Department of Commerce to ensure our country is focused on job creation, entrepreneurship and innovation, and remaining competitive on the economic global playing field. He encouraged Secretary Bryson to use every tool at his disposal to ensure that American businesses can remain competitive in the international marketplace. Click the picture to watch Congressman Rogers question Secretary Bryson on countervailing duties at yesterday's Commerce Hearing. 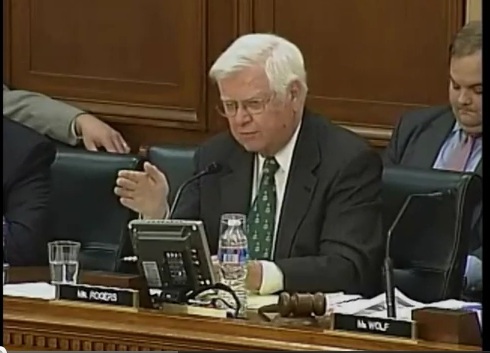 Click here to read Congressman Rogers’ opening statement at the Commerce Hearing.